If you have access to the BBC iPlayer you can see Andrew Graham-Dixon's latest series, an attempt to tell the story of the Art of France in three hours. The first episode stretches over the centuries from L'abbé Suger to Chardin. During the course of this, he visits Versailles and looks down on its gardens, with their panoptic design of paths radiating out from the palace of the Sun King. But he also finds time for a visit to the basement of the Palais des Beaux-Arts in Lille where he wanders among 'a collection of extraordinary but largely forgotten' table-top landscapes, made at the behest of Louis XIV. "They were all made for the king, these great tables. Each one is a town - a representation of a town that he had fortified. This is Ypres. This is Tournai. There were originally a hundred and forty-four of these objects. They occupied 8,000 square meters of the Louvre - nearly a mile to walk past all of them. And what they represented I think for Louis was a tangible demonstration of the extent to which he had expanded and secured France's borders. They also served a very practical purpose because when he came here with his generals or his advisers he could plan strategy. He could literally feel with his hand the lie of the land. And he could enjoy, as no-one else in the world could do, a bird's-eye view of these strategically important cities. I think the Plans-Reliefs as they are called (it's extraordinary - goodness knows how many man hours went into their creation) - I think what they represent is a making good of the promise that Versailles holds out. That, yes, the king's eye stretches to the very end of the realm." This collection of relief maps has a complicated history. Having been only accessible to Louis XIV and his staff, they eventually came to be seen as works of art, on show once a month to the public during the nineteenth century. A new set of relief plans were made for Napoleon, seventeen of which were taken by the Prussians to Berlin after his defeat. These were almost all destroyed during World War Two, but one of them, the map of Lille, was restored and returned to France. 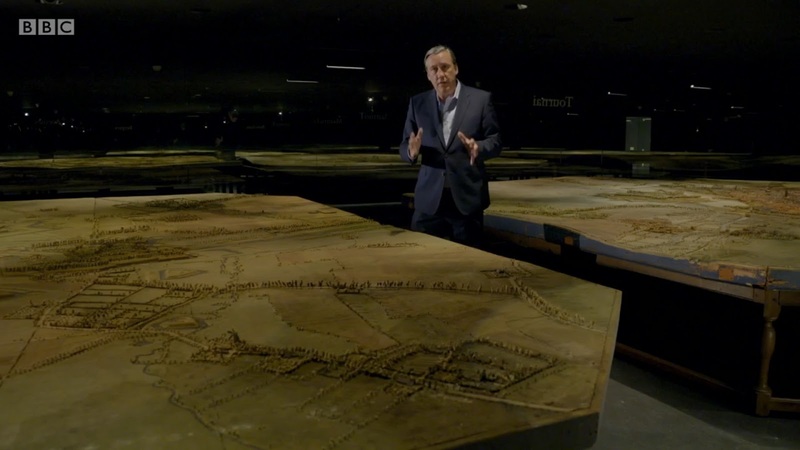 Of the original seventeenth century plans, some are still in Paris and some have been transferred to Lille, where Andrew Graham-Dixon saw them. Earlier, smaller relief plans were made in sixteenth century Venice and Bavaria. The Bavarian plans were the work of Jakob Sandtner (fl. 1561-79) who seems to have made the first one himself, which then came to the attention of Duke Albrecht, who bought it and commissioned others. But these were city plans - what I like about the French Plans-Reliefs is that they show the surrounding terrain. The inclusion of woods and fields was consistent with their use as a military tool. But their usefulness declined as technology 'improved'. 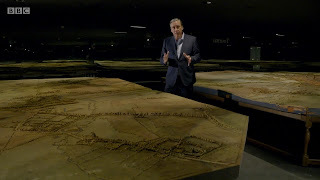 Eventually, as the director of the Paris musée des Plans Reliefs explains in an interview, the range of cannon fire was too great for maps on this scale. It is tempting though to imagine modellers trying to keep up, at work on ever larger constructions, eventually covering the whole of France and fitting together like a jigsaw. I went to Ingolstadt in Bavaria last November, and visited the Stadtmuseum where they had a replica of a wooden model of the Altstadt on display, made by Jakob Sandtner (whom you mention in this post) in 1571. Its miniature houses and churches look remarkably similar to the present day centre of Ingolstadt, as seen on Google Earth. Thanks - we are so used to seeing models like this in museums, amazing to see one that is not an imaginary reconstruction, but was actually made at the time. Link here. And his model of Munich is here.